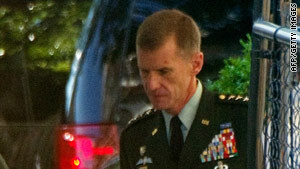 Gen. Stanley McChrystal took the fall for the failure of the U.S. war effort, a Taliban website claims. (CNN) -- The recent change in commanders in Afghanistan is proof the U.S and its allies have lost the war, statements posted on two Islamist websites said Thursday. Taliban spokesman Qari Mohammad Yousif Ahmadi said in one statement President Barack Obama wanted to save face by firing Gen. Stanley McChrystal and bringing in Gen. David Petraeus. McChrystal was relieved of duty -- although he technically resigned -- Wednesday after he and his staff made comments in a Rolling Stone magazine article that appear to mock top civilian officials, including the vice president. "History is evident of more powerful and experienced generals than General McChrystal and empires mightier than the United States of America being surrendered and bowed down before the Afghans," Ahmadi said, according to the website statement. Ahmadi said McChrystal's strategy of increasing the number of troops in Afghanistan had been futile and led to the change in commanders. The Taliban spokesman said the change in command is useless because Petraeus, the new Afghan commander, is weak. "Indeed, he has got no (more) special qualities than General McChrystal had," Ahmadi said in his statement. In another statement, a group calling itself the Islamic Emirate of Afghanistan said Petraeus is mentally worn out because of the lengthy war, which began in October 2001. "Nine years of military actions, different strategies and back-breaking monetary and life damages at the hands of mujahedeen have left the crusaders totally in distress," the statement said. Video: How will Petraeus impact war? Last week, when Petraeus briefly fainted at a Senate Armed Services Committee meeting, dehydration was cited as the cause. But the website said it was a sign that Petraeus knows the war in Afghanistan is lost. "General Petraeus, being witness to the incidents in Afghanistan is the only person who realizes the gravity of (the) situation and described this situation well by falling unconscious," the Islamic Emirate of Afghanistan said. "Through this action he gave the answer to many questions to which the members of committee were eager to listen. They should learn from this answer by General Petraeus and start working for the well being of their masses." Ahmadi, in his statement, said Petraeus has "left a big question mark on his physical and mental health."